Computing Technology is the study of principles and practices that underpin an understanding and modelling of computation, and of their application in the development of computer systems. Computational thinking provides a framework within which to reason about systems and problems, well beyond the scope of hardware and software. This mode of thinking is supported and complemented by a substantial body of theoretical and practical knowledge, and by a set of powerful techniques for analysing, modelling and solving problems. At West Island School we want to prepare our students for a world that doesn’t yet exist, involving technologies that have not yet been invented that present technical and ethical challenges of which we are not yet aware. Computing shares attributes with Engineering, Mathematics, Science and Technology. It has its own theoretical foundations and mathematical underpinnings, and involves the application of logic and reasoning. It embraces a scientific approach to measurement and experiment. It involves design, construction, and testing. It requires understanding, appreciation, and application of a wide range of technologies. Computing is not Information Technology although the two are complementary. Computing teaches the student how to be an effective author of computational tools while Information Technology teaches how to be a thoughtful user of those tools. West Island School wants our students to understand and play an active role in the digital world that surrounds them, not to be passive consumers of the technology that surrounds them. An understanding of computing concepts will help them get the best from the systems they use, and help them solve problems when things go wrong. In a world which is becoming increasingly dependent on technology, every student should have an understanding of computing. At West Island School we are building a dynamic community that cares for its people and fosters and celebrates knowledge, creativity and innovation. A vital community is one that embraces a sense of discovery, creativity and imagination at the same time as basic human values of compassion and respect. Our future depends on valuing the status of knowledge and being curious and exploratory about new ideas and new things. Ideas come from all around the world and from a variety of sources, and with such diversity comes new approaches and perspectives producing new and hopefully, innovative ideas. Our subjects provide opportunities for students to acquire knowledge, practices and dispositions that can be used to develop self-awareness, aesthetic awareness and the ability to solve problems, make decisions and communicate effectively. Design and Technology is about making things better for people. Through the study of design students develop empathetic skills required to conduct genuine and meaningful inquiring into the needs of users, they generate a range of meaningful and suitable ideas using flights of pure imagination, they apply rigorous technological processes to development and manufacture high quality products and reflect meaningfully on the impact and success of their creations. In the lower school the students investigate contemporary issues and design and make products for themselves and others, using modern and traditional techniques including CAD/CAM in materials as diverse as Food, Textiles, Woods, Metals, Plastics, Cards and Foam. There is a growing emphasis on the need to design and make in an ethical and sustainable way. In the upper school students may choose to study courses from a range of courses in Engineering Food Preparation and Nutrition, Graphic Design, Product Design and Textiles. To recognise that academic English as well as the subject specific jargon of disciplines are foreign and new to all students. To foster academic English for cross-curricular success through small groups in a language rich environment with language specialists well versed in CALP (Cognitive Academic Language Proficiency) and trained in systemic functional linguistics. To provide targeted intervention for specific text-types and academic genres, grammar and vocabulary support in context. To provide the time, support and scaffolds required to review and extend the learning of new concepts, terminology and skills from across the curriculum, whilst building on prior learning. To provide targeted conferencing with advice on best practices for drafting and editing of coursework, projects and extended essays. To provide writing frames, scaffolds, graphic organisers, pre-teaching of language and concepts alongside vocabulary to improve knowledge and understanding of subject work. To explicitly teach the IB Approaches to Learning alongside study and organisational skills to empower revision for tests and exams. To provide a range of CALP skills specific to language intensive subjects that are directly transferable across the curriculum. Our aim in the English Faculty is to foster a passion for English Literature and an understanding and appreciation of the English Language; offering support and guidance in the language in which every student is educated here at West Island School. We aim to provide our students with a passion for reading, the ability to write accurately and adventurously and to speak with confidence. We actively encourage use of our excellent library and there is a strong emphasis on the teaching of Shakespeare across all years and abilities. Students in English are well motivated, engaged and prepared to take risks – key skills for life! Our comprehensive and challenging MYD curriculum combines the rigour of British National Curriculum standards with the skills and ethos of international teaching, and provides students with the skills they need to achieve outstanding results in their IGCSEs and IB exams. We promote lessons which employ a range of resources and activities such as ICT, kinaesthetic teaching and regular speaking and listening tasks; all of which contribute to our students’ learning. This is continued into Years 10 and 11 where students continue to be taught in mixed ability groups. Over the two years they study for two IGCSEs in English and English Literature. These are fully accredited and internationally recognised qualifications, at a level slightly more demanding than the UK based GCSE. Students will spend these two years covering coursework units and preparing for final examinations in both subjects. For Post 16, Years 12 and 13, we offer three extensive and demanding A1 options as part of the International Baccalaureate: English Literature, English Language and Literature and English Literature and Performance (SL only). These courses assess a range of ideas and approaches from oral assessments, to coursework essays and exams. While the Literature course requires students to read a range of literary genres and to produce an analytical essay, the Language and Literature course provides students with the opportunity to produce several authentic text types and read an array of different types of non-fiction and fiction texts. The Literature and Performance course can only be studied at Standard Level but combines the study of literature with the analysis of performance. Students are provided with an opportunity to perform on stage and produce written coursework and exams. All three options offer a perfect starting point to university level study. The School has an inclusive philosophy that aspires to provide students with a wide range of learning needs in term of equal access to the curriculum and opportunities to every aspect of school life in order to achieve their full potential. Through the Individual Needs Faculty, the diverse learning needs are catered for as identified by the ESF’s Levels of Adjustment 1 to 4. The Faculty is an integral part of West Island School which is dedicated to ensuring that students are challenged and supported for all aspects of their learning, have experience of a broad and flexible curriculum and therefore be the very best they can be. The bespoke curricular programmes and pathways include, either an aspect of or a combination of, strengthening skills associated with literacy, numeracy, social communication, executive functioning and life skills. Advocating for the students is considered to be a vital part of the role of the Individual Needs staff in working collaboratively with subject specialists, external agencies and parents to ensuring that the teaching and learning are accommodated for adequately. The Individual Needs Faculty team consists of six specialist teachers and eight educational assistants that supports students in a variety of ways – in-class support, pull-out intervention programmes, external courses and community access. a)Strategies for School (S4S) – This intervention programme targets specific English and Maths skills to reinforce the students’ access to the mainstream curriculum whilst also solidifying their individual skills. These may include skills linked to reading, spelling, nonverbal reasoning, keyboarding, social communication, organisation and self-regulation. b)Learning Support Centre (LSC) – This programme targets students with more complex and significant needs that require extensive teaching and learning adjustments. Their curricular pursuits are specially tailored and may include a combination of mainstream subjects with alternative courses. The West Island School Learner Profile is one of the most important documents that the school has created. It states very clearly what we believe a West Island learner should be. In Years 7-9, students in the Individuals and Societies faculty follow a curriculum that encompasses elements of the learner profile and core skills required to achieve at IGCSE and beyond. Our curriculum enables all students to become better learners. The courses offered ask questions of students’ creativity, require them to be resourceful, innovative and responsible. Students are expected to regularly reflect upon the tasks and inquiries that they have completed in order to set targets for future achievement. Students are being given more responsibility than they have ever had before and they are encouraged to understand the importance of perseverance. All of the courses offered require a degree of collaboration and more importantly the understanding of what makes successful collaboration. Students are investigating new ideas across a wide range of topics and perhaps most importantly of all, from start to finish, they are required to think about the learning process. In order to make this learning effective, lower school Individuals and Societies students are on a rotation with four lessons every seven days. For example, Year 7 students will study a Geography orientated course (Planet Fashion), a History orientated course (Tyrants) and a Philosophy and Religious Studies course (Faith, Love and Hope). Some of these courses, such as Planet Fashion, involve experiential learning where students undertake an inquiry into the most suitable location for a new fashion boutique on Hong Kong Island. Once all students have studied these three courses, the learning in Year 7 and 8 culminates with an interdisciplinary inquiry. Students draw upon the learning they have experienced across the three courses in order to undertake an in-depth investigation. These inquiries and learning skills are showcased in an exhibition of learning at the end of the school year. Year 9 students have slightly longer rotations and no interdisciplinary inquiry as they use this time to explore their three subjects deeper, in preparation for IGCSE. When students begin Year 10, they will all study Global Perspectives which utilises many of the skills that have been acquired in Years 7-9. There are also a wide variety of Individuals and Societies subjects open for students to study. Students can opt from Geography, History, Religious Studies, Business Studies or Economics. Should they wish, students can study up to two subjects from this group as well as Global Perspectives. At International Baccalaureate Diploma Level, students will have the opportunity to study either Geography, Environmental Systems and Societies, History, Philosophy, Business Studies, Economics and Psychology. 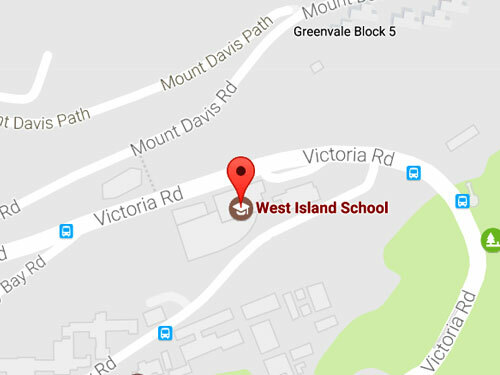 All students in Years 7 to 11 take mathematics at West Island School. From Year 7 to 9, students learn mathematics in mixed-ability classes, with lessons and assessments following the International Baccalaureate (IB) Middle Years Programme (MYP). During Years 10 and 11, students study the Edexcel International General Certificate of Education (IGCSE) Mathematics A (9-1) course. Students are grouped to offer the best support and challenge. Within each group, differentiated tasks are set which are appropriate to students’ ability, the aim being to provide support and consolidation whilst also making sure that all students are appropriately challenged. A selected group of students study the EdExcel Further Pure Mathematics (9-1) IGCSE. For Years 12 and 13, students studying the IB Diploma Programme have one of three options, Mathematics Studies SL, Mathematics SL and Mathematics HL. For all ages and abilities, we aim to ensure that a wide range of teaching and learning techniques are employed. Students will work individually or in groups and are encouraged to ask questions and take an active role in lessons at all times. They are taught to employ investigative strategies to solve problems, which we aim to present in a real-world context as far as possible. Above all, we aim to ensure students see mathematics as a valuable and useful tool with many applications as well as an enjoyable and challenging subject in its own right. Language provision at West Island reflects the nature of our community and aims to equip students with the skills and competences needed to adapt to and participate in both home and international environments. We offer the opportunity to develop mother tongue in Chinese and to study a European language. Currently our linguistic menu includes Chinese as a first language, Chinese as a second language, Chinese as a foreign language, French and Spanish. Our foreign language courses emphasise the use of the language for practical communication. Students develop their abilities in all four skill areas – listening, speaking, reading, and writing – through pair work, role play, games and a wealth of other activities and assignments. In accordance with the IB learner profile, students are also encouraged to show initiative and drive their own progress in the language by working more independently and at their own pace using the Faculty’s own websites as well as a host of excellent online materials. The skills of all students are further enhanced and reinforced by regular contact with our Language Assistants. Through conversations with these native speakers, students are offered insights into the culture of the target-language countries as well as an immersion language experience. In Years 10 and 11 students may study either one or two languages at IGCSE. They then continue with either one, or, if their university course requires this, two languages at IB level. Our first language Chinese course emphasizes literature, genre and register and aims to develop learners who will study the IB bilingual diploma (A1 Chinese) in Years 12 and 13. Lessons at West Island School are active and the students are challenged through the setting of suitable tasks within the framework of a curriculum designed to facilitate progression through each year. While developing competency and improving skill acquisition, the thinking capability of the students is challenged. Opportunities to plan tactics, strategies and sequences, perform and refine skills, and ultimately evaluate their own work and the work of others, are provided throughout the curriculum. Curriculum: The Physical Education programme promotes mental, physical, emotional and social development through guided sports activities. The students work in an educational environment which promotes an enjoyment of lifelong sport, which provides opportunities for students of all skill levels to improve their skills, ability and understanding in the sport or activity being studied. Students are also encouraged to try out a variety of roles, such as leader and official. In the lower school the students participate in 10 sports covering skills, games play, rules and tactics. Sports Covered: Swimming, football, netball, hockey, badminton, athletics, gymnastics, water polo, volleyball, tag rugby, basketball and striking and fielding. In the middle school a more whole game approach is adopted in practical sessions. Sports Covered: Swimming, football, netball, hockey, badminton, athletics, trampolining, water polo, volleyball, tag rugby, basketball, cricket, rounders, dance and ultimate frisbee. The Post 16 PE programme aims to educate students about the benefits of an active and physical lifestyle that will hopefully continue to develop after students have graduated from WIS. The programme provides students with the opportunity to participate in, and further develop their knowledge in 5 sports of their choice. Additionally all students will take part in athletics, cross country and swimming. We have a wide range of science courses available at West Island School to enable every individual to achieve their full academic and personal potential. We aim to develop within students the ability to think analytically, critically and creatively to solve problems, judge arguments and make decisions in scientific and other contexts. Science is a key subject for many of our students. At IB level, 78% of our students take a science as a higher level subject. We offer Biology, Chemistry, Physics and Environmental Systems and Societies. In years 10 and 11, students study towards international GCSE courses. The majority of our students opt to take Edexcel iGCSE triple sciences with a separate GCSE in each subject. We also offer a ‘double science’ course where 2 science GCSEs are awarded, based on attainment in all 3 science disciplines. A few students each year opt for our CIE single science combined award. In year 9 we currently run a course based on the UK national curriculum that is an introduction to our iGCSE courses. We offer MYP for our current year 7 classes, and this course will move into Y8 for 2019-20. The MYP science program is inquiry based and includes a focus on practical work and the scientific method.